I’ve mentioned in the past that you, the audience and fans take photos and video and have these online/on YouTube before we, the band can get home! So I think I should say, “Thank you!” to all of you! Returning to the UK in 2012, TM Stevens visited ACM for 5 DAYS (between 12th-16th March 2012), giving a series of live performance sessions, guest lectures and an EXCLUSIVE bass masterclasses. It was an experience of energy, a stunning stage presence and performance skills by TM Stevens. TM Steven’s skill and proficiency as a bassist and vocalist is globally legendary. A luminous figure among today’s bassists, he has unbelievable energy, stunning stage presence and knows how to win a crowd over within minutes. His ferocious, yet melodic, style of bass is as unique as his larger than life persona. Never losing sight of his own special blend of signature roots music, Heavy Metal Funk, TM’s versatility and heavyweight skills as producer, songwriter, film score composer, singer and instrumentalist are his signature traits. Over the years Stevens has recording and/or performing with award-winning stars like Steve Vai, Whitney Houston, Cindy Lauper, Little Steven, Tina Turner, Little Richard, Stevie Wonder, and Billy Joel. Also as a former member of The Pretenders, TM played on the platinum album Get Close. Visit the official TM Stevens website for more information and background. It’s already April, nearly the end of April, and that means we’re fast approaching Festival Season! I’ll make sure that this list is kept up-to-date and hopefully see you all there!! The last Nik Kershaw tour was great – we played some huge venues and for those on Facebook, you’ll already know that things went, “much better”. So here are some of the photos and thank you to everyone involved – it was a great way to end 2011! The Academy of Contemporary Music (ACM) in Guildford has some incredible links with people through-out the music industry – musicians, producers, engineers and managers. We are also very lucky that these people are prepared to share their time with us and the ACM students – which gives a great “reality” and insight into the music business. Thank you to Roger Taylor and everyone who was involved for an exceptional day! The Academy of Contemporary Music (ACM) is Guildford has a long-term relationship with Roger Taylor of Queen. Roger has been incredible, providing inspiration and feedback for the students and an incredible “trove” of Queen memorabilia which is now on display in the “Roger Taylor Zildjian Studio”. Check out the full story on the ACM website. I’m getting excited and we’re learning new material for a week of Nik Kershaw gigs starting in Holland on the 26th of November, moving on to Hamburg and Berlin in Germany on the 1st & 2nd of December and finishing off in Belgium on the 4th of December. As always look forward to seeing you all!! I’ve been playing loads of festivals and smaller venues with Nik Kershaw over the summer. Nik’s fans are very loyal, happy and in good voice which makes for a great atmosphere and we, the band have a great time. Thank you all for coming to the gigs!! Happy Days with Nik in the sunshine! We (and you in the crowd) were all so so lucky to have fantastic sunshine and a great day for the “Happy Days” festival in Esher. It was a great opportunity to to use the new Orange Rig and great to be out playing live to excited and sing-along crowds! Check-out a few of the photos and I’ll try to hand-pick some of the better YouTube videos which I’ll link to in the next few days. 1. The list runs from now (March 2011) until Christmas 2011. 3. If all of the bookings confirm then we are all going to be very busy! 4. That’s a lot of air miles!! growing support for the band! Thank you so much for the name-check!! London Bass Guitar Show – this weekend! I’m going to be on-stand with Rotorsound and Eden at the London Bass Guitar Show this coming weekend! (12th & 13th March 2011) It’s going to be a busy show, lots of new products and endorsements from some great musicians. 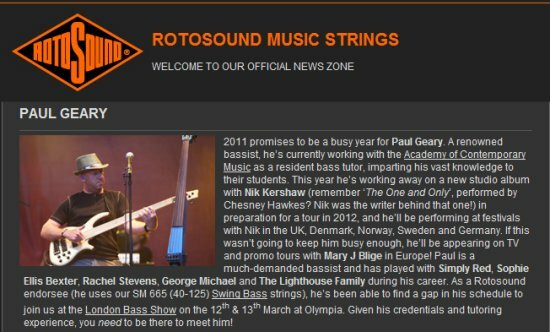 I’m sort-of coming to terms with finding myself in video clips on YouTube, playing at a festival, sometimes fans link to this Paul Geary website but it means so much more and is very exciting to have a link and article written on the Rotosound website. 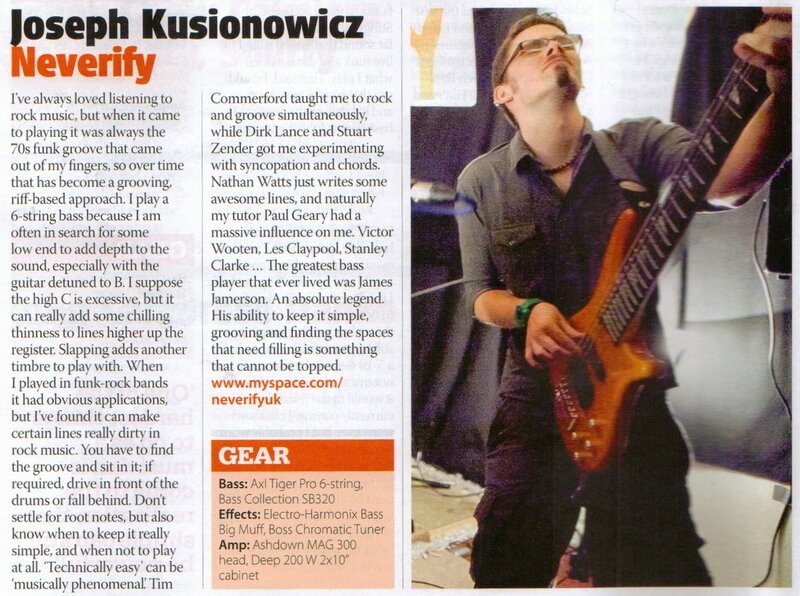 Thank you Rotosound! !